Hortus Camdenensis | Micranthus alopecuroides (L.) Rothm. Frost-tender cormous perennial with lance-shaped or linear leaves and a sometimes branched stem bearing numerous, small, irregular, slightly scented, individually inconspicuous pale to deep blue flowers, the outer lobes sometimes tipped with red, in summer. To 40cm. [RHSD, CECB]. 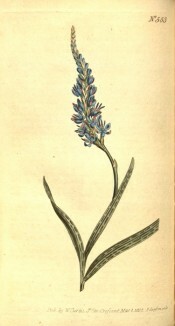 ‘[Flowers] dark blue with a sagittate base. Said to vary with white flowers. Scentless. Like Watsonia spicata, sometimes produces small oblong bulbs, 1-3, in each spathe instead of flowers, these germinate when fallen off. Found by Thunberg near the town, at Swellandam, in Carro, and sometimes in the high-roads. Our figure was taken from a plant received some time since from the Cape, with many others, by Messrs. Grimwood and Wykes, at Kensington. Introduced into the royal gardens at Kew in 1774, By Mr. Masson. This the smallest of the tribe yet known.’ [BM t.553/1802]. Introduced to Britain in 1774. [JD]. Listed in the 1845, 1850 and 1857 catalogues [B.450/1845]. In Macarthur’s possession since at least 1844 as bulbs were sent to Wm. Macarthur Esq. in February of that year. [MP A2948-3].